Books, bookshops, a polytunnel, running, Tories scupper Humanity, an old door. 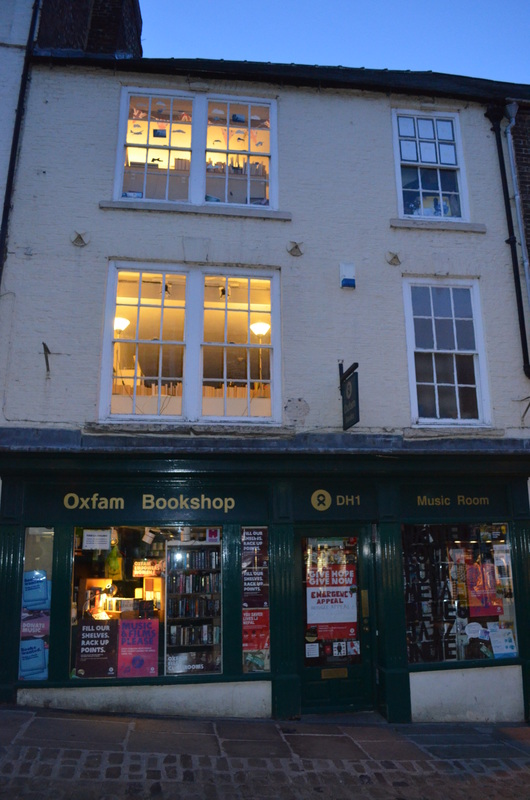 The Oxfam bookshop in Durham, where we stayed, and a short train journey from Newcastle and the Great North Run. Second hand books on three floors. 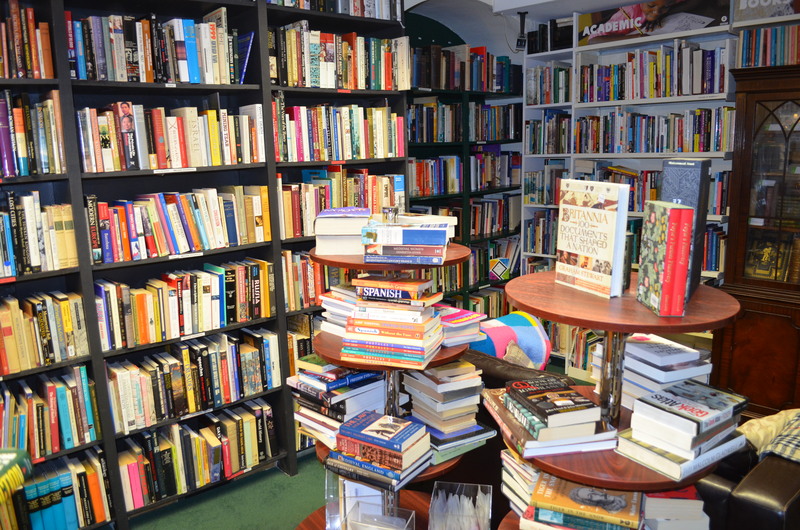 Lovely shop, huge selection of books but substantially more expensive than any other comparable shop. Oohh… look! 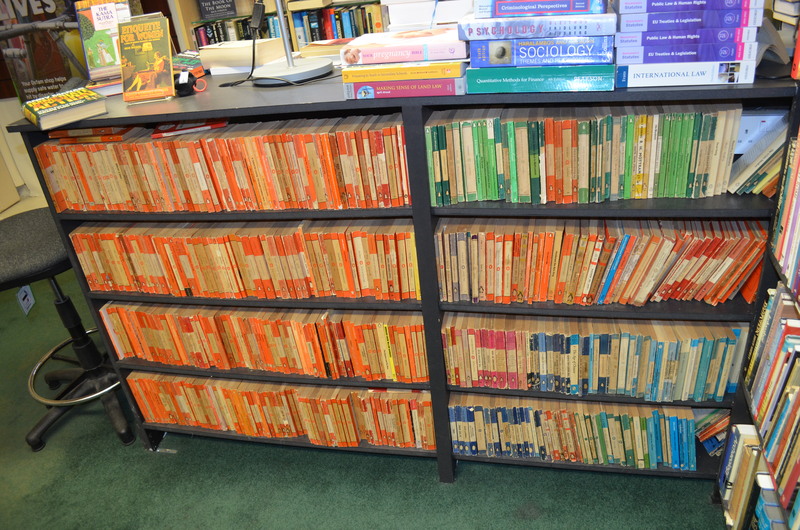 A load of orange Penguins and old Pelicans. I toyed with the idea of hiding in the shop overnight but decided against it. The sheer volume of all these pre-loved books weighed heavily upon me. I didn’t want to risk overdosing on the written word. Back to the running world. I’m doing a half marathon on the Wimpole Estate in 8 days and only started training for it 5 days ago. In those 5 days I’ve done two 10 mile runs without any problem and I’ll probably do another 10 or 11 mile run and a parkrun before the half. This should be adequate for me to get around the course without the pressure of going all out. It’s nicely undulating and mainly trail. The last time I ran it (2013) I came in at 1 hour 55 minutes. I anticipate 2 minutes longer this time. I often run along the river Cam, which, depending on the time of the season, is littered with anglers. As a rule, they never acknowledge anyone passing and continue to stare vacantly into the water in the forlorn hope of catching a luckless fish. They are invariably alone and occasionally smoking. All appear to have a sense of humour bypass otherwise they would be continually laughing at the notion that fishing is a sport. Anyway, for the first time in 16 years of running by the river, one of the fishing people actually turned around, smiled and said hello. And then, to add to the sense of unreality, he made a comment expressing surprise that a group of young lads who just passed us were not in school. I responded in kind and had to stop myself commenting that he wasn’t following accepted protocol governing angler/runner interaction. I ran on, light in heart, relishing our transgressive behaviour. If I see him again it’ll be my turn to take the initiative. I hope he hasn’t been cast out of the fishing world for unauthorised contact with a runner. Only joking (mildly). 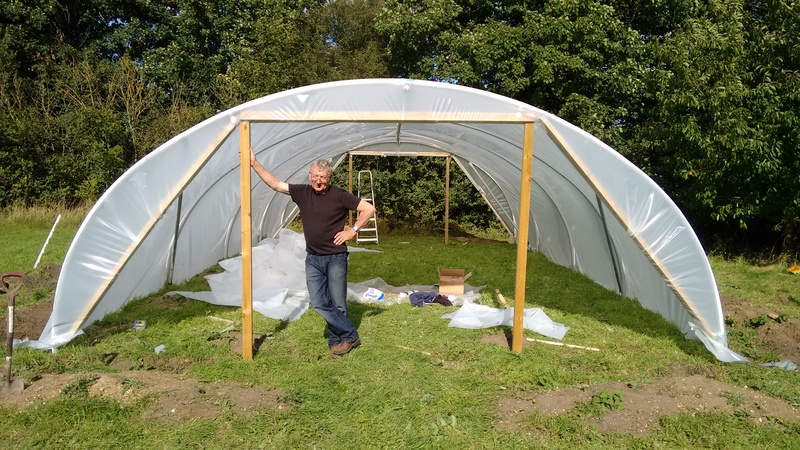 My polytunnel is up and running! This is Guy who masterminded the construction. Green Minds, my fledgling therapeutic gardening project is progressing very, very slowly. The actual site is being developed by friend and charity trustee, Rebecca and myself but referrals to Green Minds have yet to materialise. The timescale for things to happen is a lot longer than I had anticipated. It will happen, I’m sure, and I’m very grateful for generous financial and plant donations from friends Elaine and Robert. This Guardian piece on the “downfall” of Cambridge’s Addenbrookes hospital is worth reading for its perspective on so called “failing” hospitals. 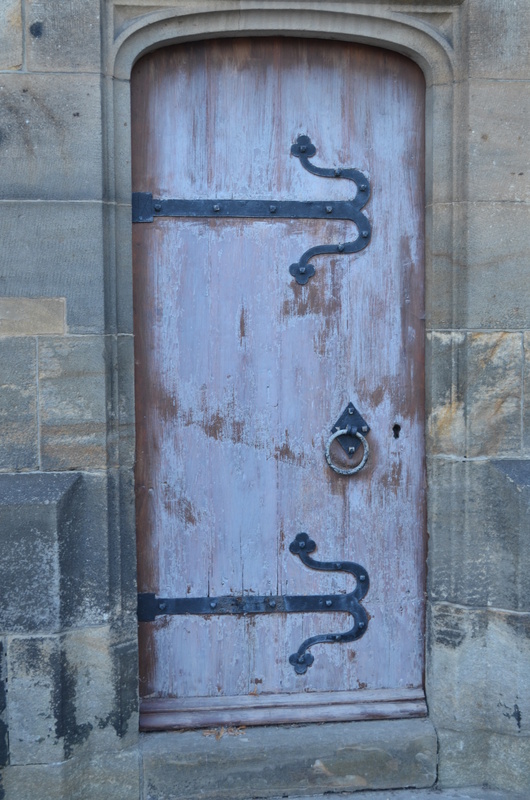 Finally, here’s a lovely old door, currently attached to Durham Cathedral. What’s behind it, God only knows! Abject apologies to the entire blogging world. I accidentally pressed “publish” instead of “save draft” yesterday. I failed to notice this until Jeremy Corbyn, the new Labour leader’s media team contacted me and said Jeremy had commented that he was sure I wanted to say a bit more in this blog. He was right! Thanks Jeremy. 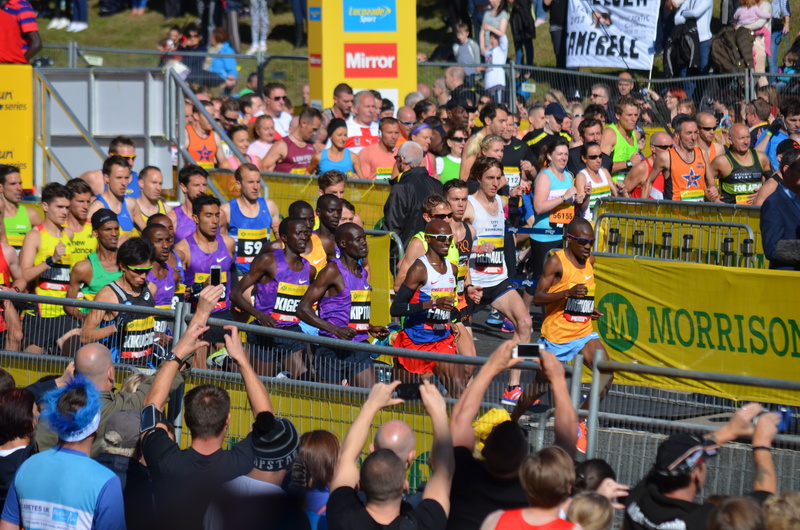 The Great North Run in Newcastle last weekend. 47,000 runners gathered on a closed motorway and ran to South Shields on the coast 13.1 miles away. I wasn’t running but I was there as a spectator and supported Joe, my daughter’s boyfriend and a family friend, Sue and her friend Abi. Also spectating were Ms Alive and Running (Lorna) and Mike, Sue’s husband, previously an arch rival but now so fast even Mo would tremble at the mention of his name. A great race and a great atmosphere but not such a great transport system. We had huge difficulties getting back to Newcastle and my daughter Isobelle missed her connections back to London. Nevertheless it was a good running day, the weather could not have been better and the previous day we had a great meal with Joe’s lovely family who live in Newcastle. 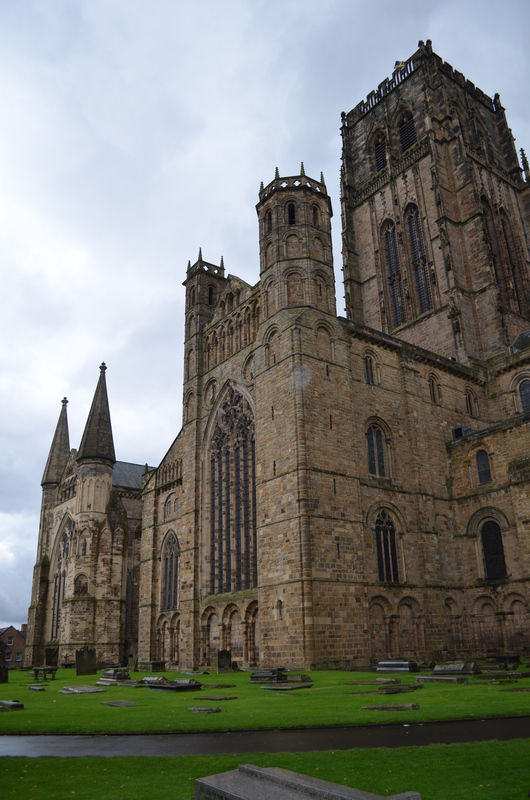 We stayed in Durham, a short distance from the magnificent Cathedral which dates from the eleventh century. A hauntingly beautiful building, a monument to religious worship and complete indifference for the human condition as lived at the time. We climbed to the top of the Tower which called for a great deal of effort. I didn’t feel any closer to God despite the spectacular views. A wonderful, spiritual building and a reflection of man’s hubris and vanity all in one. It’s full of male commemoration and eternal respect for the great and good but I didn’t see many women represented. Am I being unfair, casting a twenty first century cultural eye over a medieval society? No, I’m not that kind of guy. Perhaps I over think these things. No, you don’t! Yes, you do! Out running with the club yesterday. We went over to the American Cemetery to do some hill work (you really have to seek out the hills around Cambridge). It was completely dark by the time we returned to the University athletics track. Some of us were wearing head torches which are very helpful if the beam is strong enough. I’m considering getting one. It will only be worthwhile if I start running in the evenings, of course, because if you wear them during daylight, people are not greatly impressed. I’m happier with the club at the moment. They are trying very hard to introduce new training runs and are seeking feedback and runners’ views. This is good. I also feel they are considering slower runners’ needs which can be a difficult balance, on the road, when there is such a disparity of speeds. So Jeremy Corbyn is the newly elected Labour Party leader. Despite all the media scorn and high level of spite from his own colleagues, despite the vicious condemnation from the political pundits and various stupid people, he won the contest overwhelmingly. There will be spin and compromise and economies with the stark truth but nothing like the degree of falsity and degradation of values under previous Labour regimes. It’s widely predicted Labour will be unelectable at the 2020 election. I don’t believe this. Coming next on the blog………pictures of a bookshop (actually inside the bookshop as well) and old wooden doors. It’s that exciting. 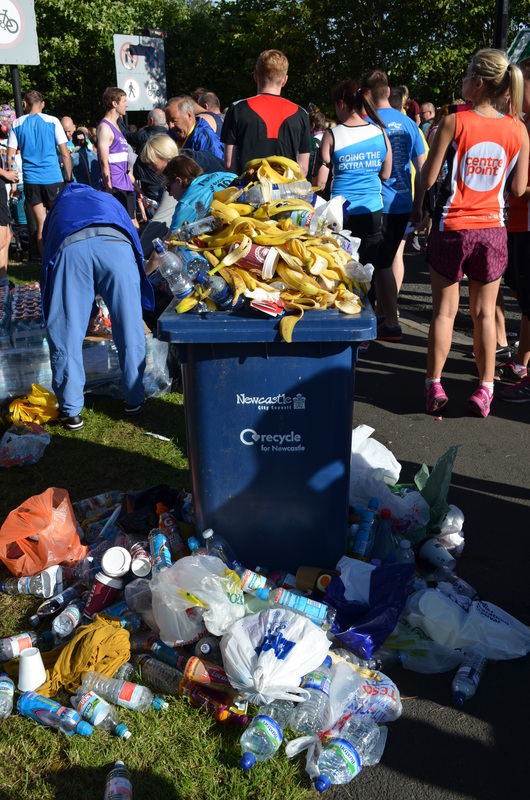 The Great North Run in Newcastle last weekend. 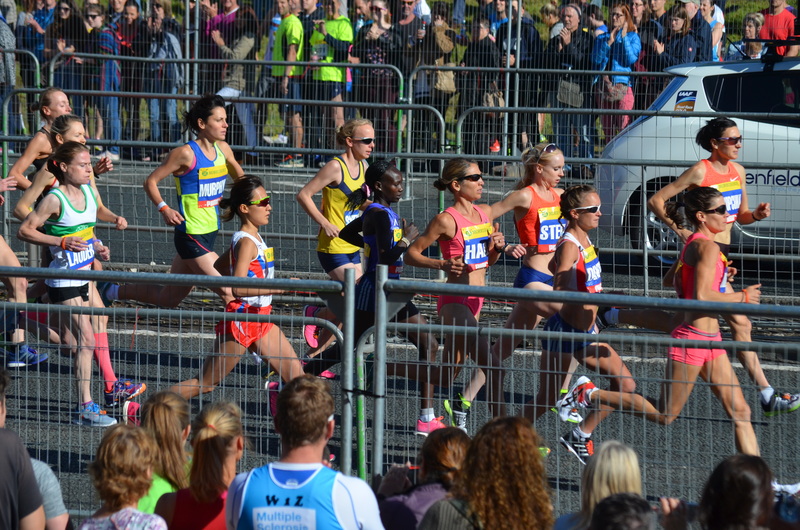 47,000 runners gathered on a closed motorway and ran to South Shields on the coast 13.1 miles away. I wasn’t running but I was there as a spectator and supported Joe, my daughter’s boyfriend and a family friend, Sue and her friend Abi. Also spectating were Ms Alive and Running (Lorna) and Mike, Sue’s husband, previously an arch rival but now so fast even Mo would tremble at the mention of his name. A great race and a great atmosphere but not such a great transport system. We had huge difficulties getting back to Newcastle and my daughter Isobelle missed her connections back to London. Nevertheless it was a good running day and the weather could not have been better.